A/N im going to add quotes or like song lyric  to beginning of chapters to give it Good meaning! I smiled at the thought at having someone watching over me as I walked home from school,  Mark would make sure I&apos;m okay. Though it was a bit weird he was my teacher.I worried about that,what if someone found out? They would take him away and I would be exposed. I shook the  thought away and continued to walk. I heard a russle of some leaves and turned toward the direction it was coming from. I then saw a Bush shake slightly, and a small teen fell into view,I watched as he grumbled and and stood up,brushing leaves from his brown mess of hair,facing away from me. He looked at his hoodie and  grumbled more cleaning it of leaves. I was confused at this peculiar situation. "Um...hello? Are you okay lad?" He perked up and turned toward me. I was expecting a face to be looking at me,but was greeted by a mask with a poker face.it caught me by surprise,and I jumped a little. "Uh....hi.." I was kinda scared he was going to jump me. He adjusted his mask,then held out a hand.
" Salutations my good sir, My name is cry nice to meet you." I shook his hand slowly. " 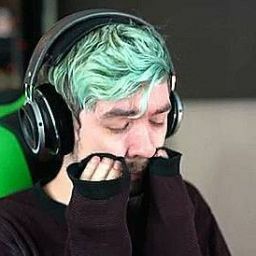 um, I&apos;m jack ...nice to meet you..." he gave a small chuckle and placed his hands in his hoodie pockets. "Jack please don&apos;t be worried. I know the mask is disconcerting,but I cause no harm." His voice didn&apos;t seem to match his small build, it was mysterious and a little deep for a guy like him. "Well that&apos;s good cause I didn&apos;t fancy on being jumped." He gave a small chuckle and returned to the Bush pulling out a green backpack and slung it over his shoulder. He looked up at me with the mask I will admit it was kinda creepy." You mind if I walk with you?" I thought for a moment. i alone and I did just meet him,it couldn&apos;t hurt. "sure lad,I don&apos;t mind." He nodded and we began to walk. As I walked with cry we got to know each other. He was 17 and recently moved here like me, he had ended up in the bushes when he took a wrong turn. He was also going to YT high school. I told him about my self too, he nodded and said he had  seen me around  the school. Overall I liked cry he was a Decent guy, a little weird but good. As we turned the corner I spotted my house. "Well lad, This is we&apos;re I leave you. See you tomorrow." I waved  him a bye and entered my house. I dropped my bag by the door and hollered." MA!I&apos;M HOME!" I sniffed  and I could smell sweet Carmel,I followed my nose till I was  in the kitchen where my ma was baking. I smiled at the sight of Carmel cookies on the counter and her pulling out another Bach. "Wow ma, what&apos;s the occasion?" She smiled at me and handed me a Cookie.I happily took a cookie and bit into the sweet Carmel. " oh, nothing jack I just wanted to make the house feel like home so I made cookies like I always did in Ireland." She smiled again taking a cookie herself." So deary how was your first day?" I then remembered what happened with Mark,and blushed slightly. " oh ..um not much, but I made some friends." She raised an eyebrow smirking at me." Some &apos;friends&apos; huh? What type of friends?" She made me blush more, my ma could tell when I was embarrassed. "Just friends ma, nothing more. It&apos;s just the first day!" She  laughed and  poke  my stomach." You&apos;re so easily embarrassed! Ok, you should finish unpacking your room ,Mr. Just friends" I rolled my eye playfully and went to unpack. I frowned at the text, who could it be from? no one had my number yet.I was scared yet oddly curious.I walked down the hall to the front door looking outside. At the bottom of our front steps was a small box. I picked it up and pulled off the small note taped to it. "To Jack :) " I frowned and took the box to my room. I it set down on my desk and opened it up slowly. I peeked inside and saw something blue, I opened  it all the way and pulled out the blue object holding it up. It was a hoodie, I turned it around finding another note. I set the hoodie down, reading the note. "Dear jack, here&apos;s a hoodie for you! I hope it fits! :D "
I turned the note looking for a signature but no avail. I turned my attention back to the hoodie picking it up and siding it on. I stood amazed,the mysterious hoodie fit like a glove. I looked  at it,where and who did this come from? I furrowed my eyes brows at the thought. I had met a lot of people but none but cry knew where I lived anx I hadn&apos;t given him my number. I slipped off the hoodie throwing it on the back on the chair. Who ever it was seemed to be nice,that terrified me. Sorry about such an uninteresting chapter but it just wanted to show you guys a look into his life. Did you enjoy crys little appearance? Any whozzles hope  your enjoying it!